I’ve been trying to find time to write this since the third Thursday of July, when it was once again time for me to take a break from metal clays and mention the Edible Flowers Food Fest. The event was begun by Denise Schreiber (Mrs. Know It All on radio and Facebook) and is sponsored by the the Allegheny County (Pennsylvania) Parks Department and the Penn State Master Gardeners of Allegheny County. Oh, and it’s on a Thursday so that the various helpers have most of the week to prepare everything! 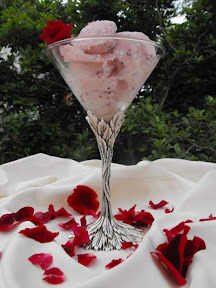 Rose Petal Ice Cream (shown) that started it all…. I helped fellow Master-Gardeners with several other items too. Susan, Joan, and I assembled 50 pitchers of lemonade (two different flavors). For no obvious reason, I wasn’t involved with the fruit salad: others had that under control. But I mention it because real treat with that was the big “serving basket” that George had carved out of one of the watermelons whose flesh went into that dish. Anyone with a spare moment would go over to the table where Lyn and Gerri were cleaning and preparing donated flowers for all the different dishes and put in some time there. I took care of the violas that Martha has brought, and several varieties of roses (I’m not sure who-all had brought those). And by preparing I mean handling each flower individually, removing all the stamens and pistils plus trimming off, as needed, any of the white (bitter) part at the base of each individual flower petal. Although I love all the food itself, one of my favorite things about helping out with the EFFF involves the number of gardening conversations is initiates. Not just at the event, but throughout the year: whenever I mention it, I can pretty much count on an interesting discussion to follow. Vegetable gardeners may talk about companion-planting flowers with their usual crops; landscape gardeners who may not be interested in expanding into vegetables will still ask about which of their current color-accents may or may not be edible; people who enjoy cooking regardless of their experience with actual gardening can still talk about the color, texture, and flavor contributions of various edible flowers. So I’m going to have a rough time, knowing that the EFFF will not be happening in July 2014. Denise will be too busy hosting the 66th annual Garden Writer Association Symposium. But we are told that the EFFF will return again in 2015. Here’s hoping! The thing is (and maybe I simply missed this in my rushing around) I just don’t see a way to make WordPress and GigaPan talk to each other directly… You are just going to have to click on the tiny, blurry image of water- and day-lilies to open a new window with the image I really want you to see, a 360° panorama of a National Historic Registry property owned by Nancy Marshall. (Oh, and use the navigation buttons on that page to zoom in and move around and really explore the entire image!) We did not impose on Nancy’s hospitality (two weeks ago) to beg her for flowers to use during the Edible Flowers Food Fest (this past week), but one of my thoughts while setting up the equipment to take this 360° panorama was that, while most lilies are NOT edible, daylily buds sure are…. Yum! Here’s hoping that (a) the rains (with flash-flood potential) predicted for this afternoon and evening will hold off until later tonight (the show runs until 4 pm, but it’d be great to not be packing up in the rain either…) and that, (b) if you are in the area, you will stop by. Lots of creative energy and treats to be shared all day! One-of-a-kind pieces that you’ll only find if you buy _local_ art! Or, if you don’t see this until later (and thus don’t have time to get out there today), well, I have given several announcements that this was coming. But, never fear: just put next month’s session on your calendar. 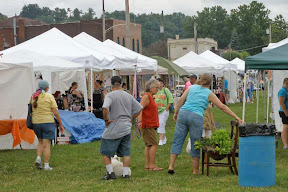 Once again, it’ll be the first Sunday, which means it will be on Sunday, August 4, from 10 am to 4 pm. Of course, if you do get there today, you can always come back again next month too!